There are plenty of companies vying for a piece of the worldwide cloud infrastructure market, but the top four -- all in the U.S. -- currently dominate by such a wide margin as to effectively leave their competitors in the dust. That's the overriding conclusion of a study released Monday by Synergy Research Group, which provides quarterly market tracking and segmentation data, including vendor revenues by segment and region. Amazon Web Services, Microsoft, IBM, and Google collectively control more than half of the worldwide cloud infrastructure service market, Synergy found, with an overwhelming lead by AWS, which held a 31 percent share in the second quarter. Microsoft came next with 11 percent, while IBM weighed in at 8 percent, and Google came in with 5 percent. Synergy included infrastructure-as-a-service (IaaS), platform-as-a-service (PaaS), and hosted private cloud services in its figures. “Amazon and the other big three players have distanced themselves from the competition in this market and continue to widen the gap,” said John Dinsdale, chief analyst and research director with Synergy. “What marks them out as different is their global presence, marketing muscle, ability to fund huge investments in hyperscale data centers and, in most cases, a determination to succeed in the market." The top four leaders are also growing more rapidly than their smaller competitors, Synergy found. In aggregate, the big four grew their cloud infrastructure service revenues by 68 percent in the second quarter, while the next 20 largest providers grew by 41 percent. All other smaller providers grew by just 27 percent. Overall, the market as a whole grew by 51 percent. AWS remains "in a league of its own," holding a clear lead in all major regions and most segments of the market, Synergy said, but Microsoft and Google are enjoying substantially higher growth rates. 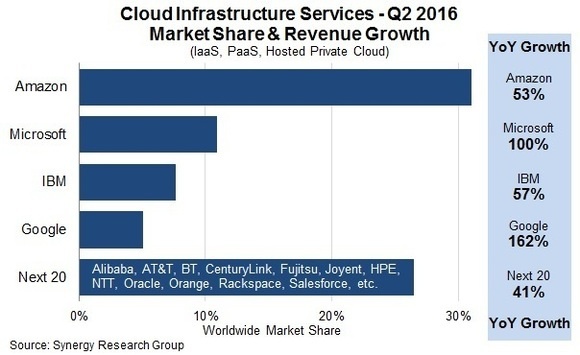 IBM, meanwhile, leads the hosted private cloud segment, it said. Global revenue for cloud infrastructure services is now close to US$28 billion, Synergy estimates. North America continues to account for more than half of the worldwide market. Though the Europe/Middle East/Africa and Asia/Pacific regions are similar in size, Asia/Pacific is growing more quickly. U.S. companies are often at the head of the pack in technology markets, but the heavy dominance in this one is striking, and it's not for any lack of overseas competitors. Also included in Synergy's top 20 are Alibaba, Fujitsu, NTT, China Telecom, BT, and Orange. Cloud is also an area where privacy and other issues have sparked strong data-sovereignty concerns, particularly in Europe. Numerous cloud companies have built regional data centers in response, and Privacy Shield -- the replacement for the defunct U.S. and Europe Safe Harbor Agreement -- just recently took effect, promising to ease data transfers. Still, the U.S. dominance of cloud services could present opportunities for local cloud providers, Dinsdale said. "I expect to see vendors in other regions, particularly Asia, grow rapidly and become increasingly competitive," agreed Charles King, principal analyst with Pund-IT. "Political issues in some countries -- China is a good example -- will likely make it easier for homegrown companies to compete there, and curtail efforts by vendors from elsewhere." Looking ahead, the sheer size and variety of the cloud market make it unlikely that any one vendor will become fully dominant and threaten innovation or choice, King said. Instead, "we're seeing vendors build much of their efforts around specific areas of expertise," he said. "That's great for customers since many of the resulting services are well-attuned to their actual business needs."